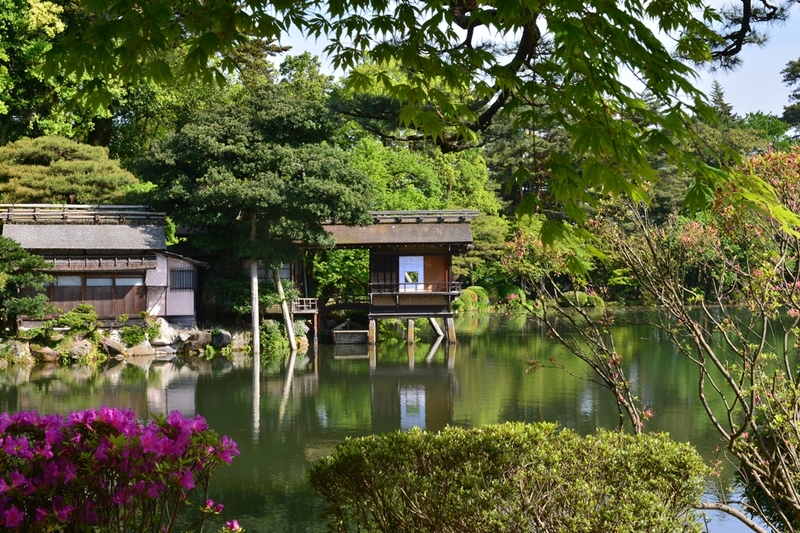 Throughout major Japanese cities, such as Shinjuku (Tokyo), or Mito (Ibaraki), a traveler might be surprised to find that smack in the middle of the city, there lie beautiful, hidden gardens, separating nature and wildlife from the bustling city. 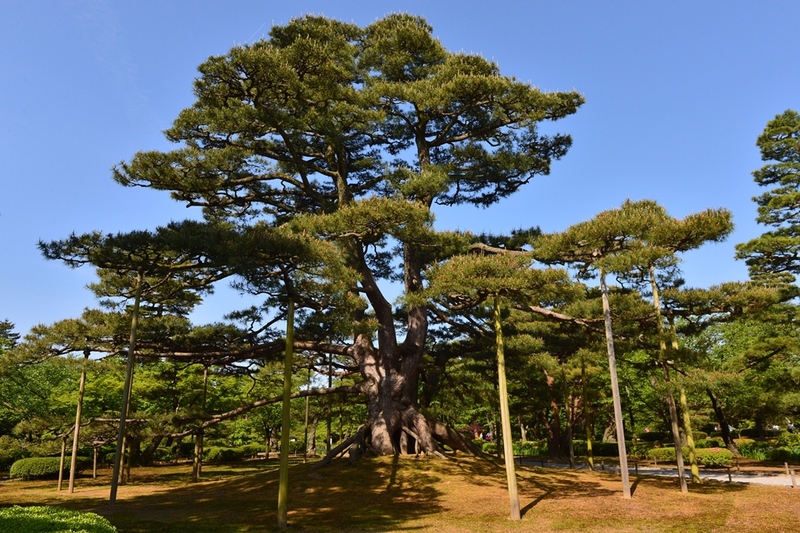 Such is the case with Kanazawa Kenroku-en, one of the Three Great Gardens of Japan, alongside Kairaku-en and Kouraku-en. So, what does one of these “isolated” gardens have to offer to an average tourist visiting a Japanese city? First, you will definitely find serenity at the garden. Isolated yet located in the heart of Kanazawa, you will barely hear any traffic or outside sounds coming in to the garden. Despite all the chaos that happens in the big city, or even back home where a traveler comes from, this garden has nothing to offer but peace and tranquility. Looks like ordinary grass that’s covering the ground? 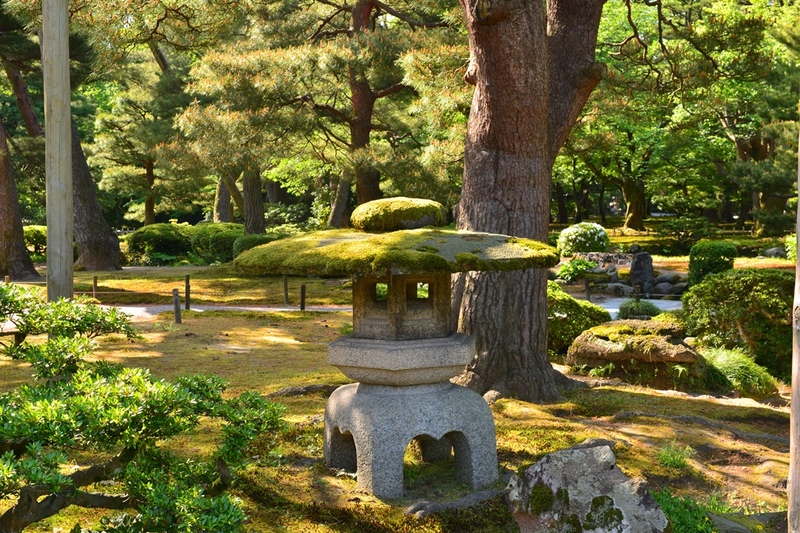 Not really– the Japanese garden’s “koke”– or green moss– is carefully calculated and grown to cover the ground and other plants in a particular pattern. 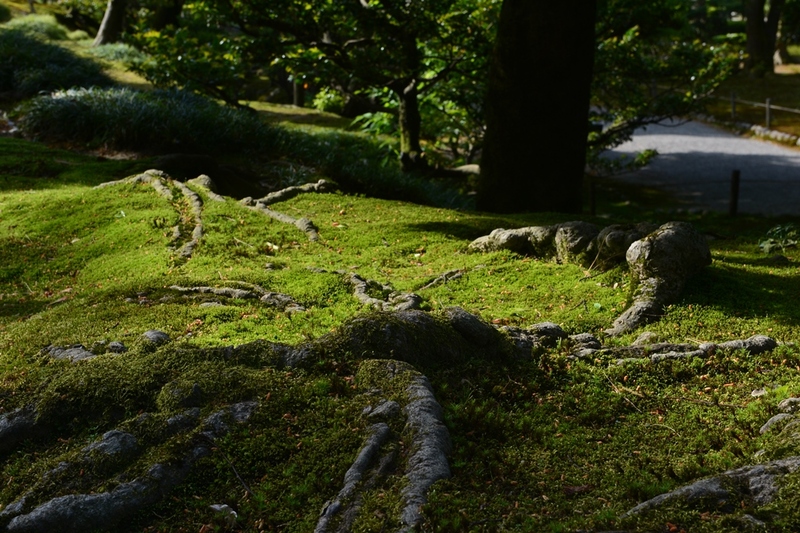 So next time you see green moss, don’t make a mistake and think: “Hey, these gardeners don’t even weed their garden!” The moss is part of what sets the tranquil tone in Kenroku-en. Next is the element of space. Kenroku-en has carved out a super spacious garden in the heart of Kanazawa– something that would probably be impossible to do in present day Japan. So enjoy this spaciousness, and next time someone comments the cliche phrase about space and Japan, tell them that they must not have seen one of the Three Great Gardens of Japan, Kenroku-en! What comes to mind when you are at a garden? Beautiful flowers and garden sculpture, perhaps? Kenroku-en has both these– and more. Every angle of the garden is like the background scene of a ukiyo’e painting. Take these purple irises, for example. They are aligned along the waterway, which winds and curves throughout the entire garden. Or take this stone lantern, beautifully covered in moss. Every corner of the garden is filled with surprises and discoveries, and it’s guaranteed that you will not get bored with any scenic corner of Kenroku-en. 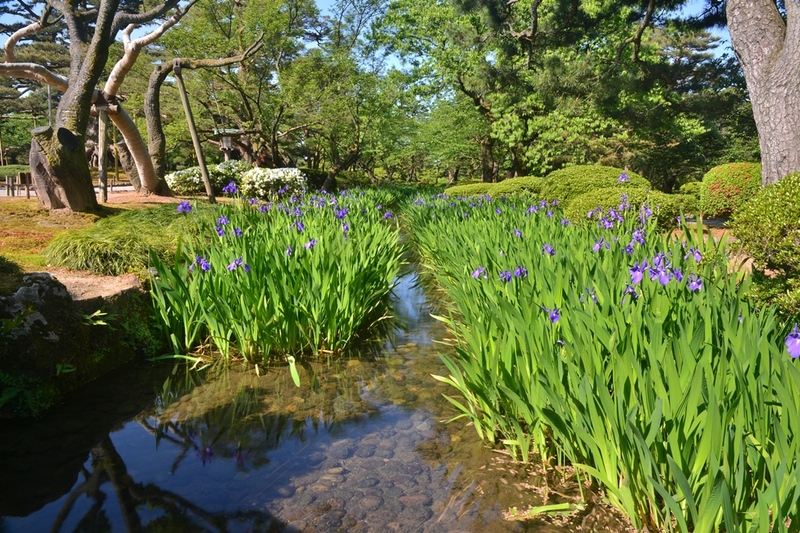 When there are waterways, it is difficult to attain a wide view, and when you have a wide view it is difficult to incorporate waterways– so it is said in Eastern gardening traditions. Kenroku-en seems to achieve coolness not only through its waterways and fountains (the oldest in Japan! ), but also by providing much shade and filling its corners with flowers and greens that make a person feel mentally chill. 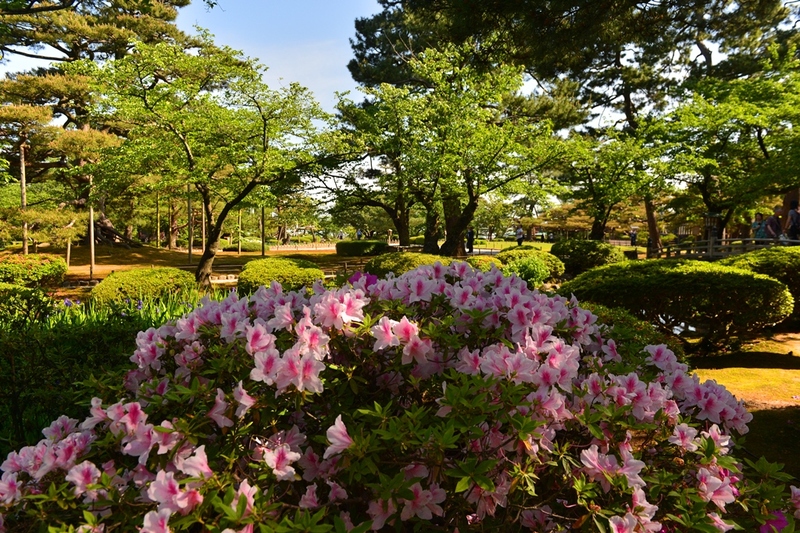 The Japanese azalea come in full bloom and provide beautiful touches of pink, red, and white. You will find many of these flowers close to the waterways and between shades of larger trees. Here is an example of how “coolness” is achieved by shade. Sure, the aging pine supported by wooden poles is respectable and impressive, but so is the shadow reflected on the ground. This element is shared by many traditional Japanese architecture and designs. Take this base for the tree, for example. 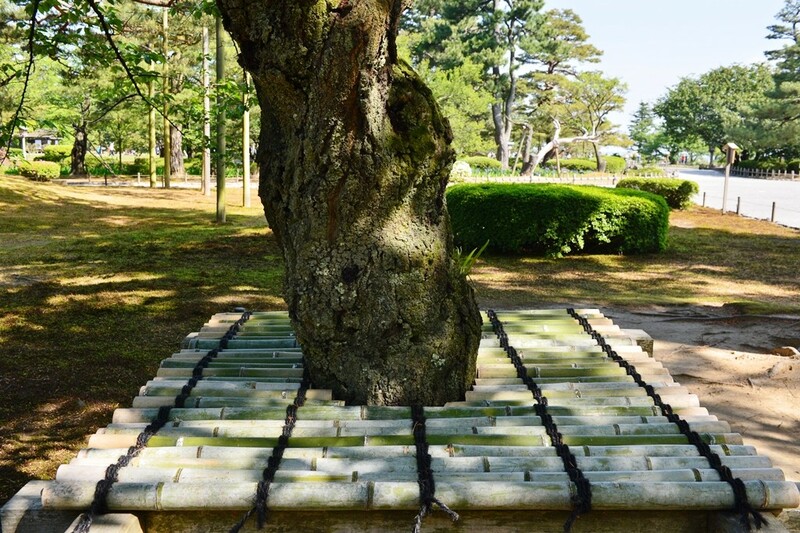 The bamboos, carefully aligned, are cut and bound so that it will barely touch the tree it surrounds. One rarely sees this kind of craftsmanship in the world, and Kenroku-en is a prime example of Japanese craftsperson honing their skills and putting them on exhibit! What good is a magical garden if people don’t have respect for it? Much in the same way that Japanese tea ceremony and temples have rules of venerability, so does the Kenroku-en garden. 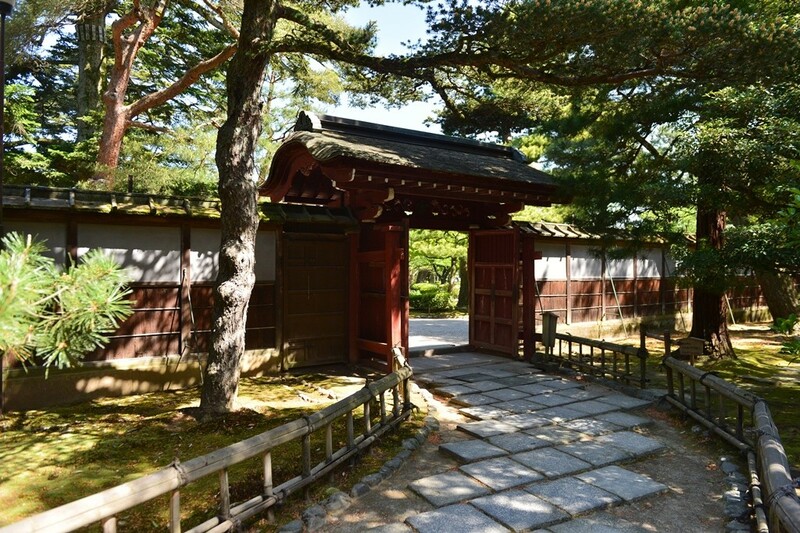 If you really want to fit right in with the traditional garden and flaunt your knowledge and skills as a tourist in Japan, learn some of the rules of how to enter the garden– which foot should come out first when passing through a gate– should you take off your hat?– what route is the correct way to go around the garden? Sure, too much rituals can get a little overwhelming, but having at least the knowledge and etiquette will definitely enhance your experience and respect of those around you. After all, you are an honored guest in this magical garden! This post focused on the aesthetic aspect of Kenroku-en and its magical six essences that make up its unique character. Don’t worry though– just like the rest of Japan, much of the architecture and land has history, tradition, and culture that will undoubtedly blow your mind away. 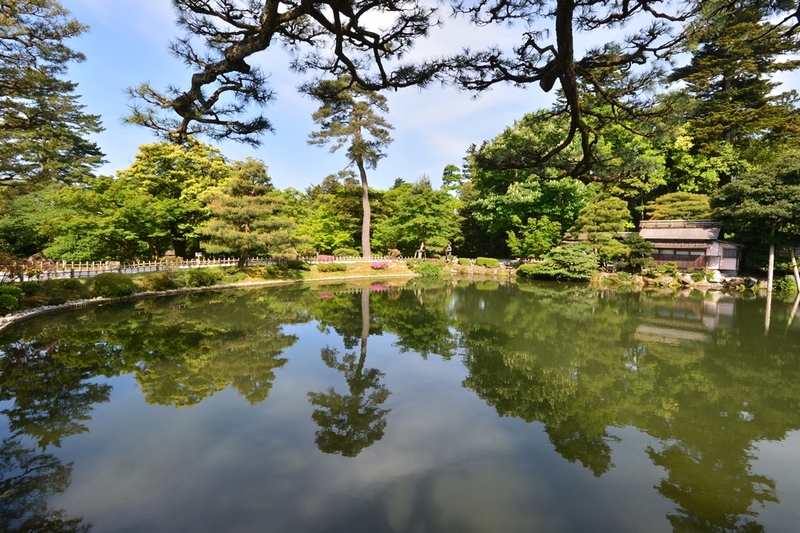 It is said that the name Kenroku-en is an enigma or an oxymoron because in Eastern gardening tradition it is said that the six elements mentioned above cannot all coexist in one garden. But when the Kanazawa Castle rulers named this place Kenroku-en, they must have imagined accomplishing the impossible– and wanted Kenroku-en to hold their dreams and expectations of making Kanazawa one of the most influential and powerful cities in feudal Japan. 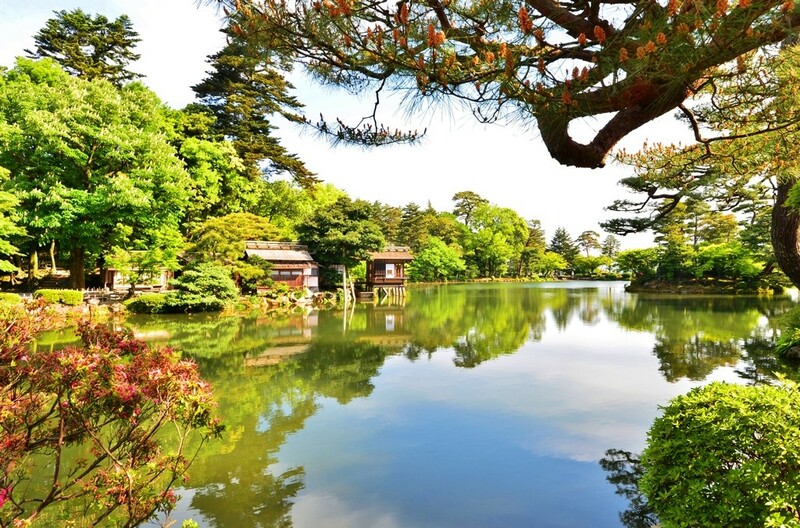 Kanazawa is a big city filled with more than 100 tourist destination favorites and rich with culture and art. 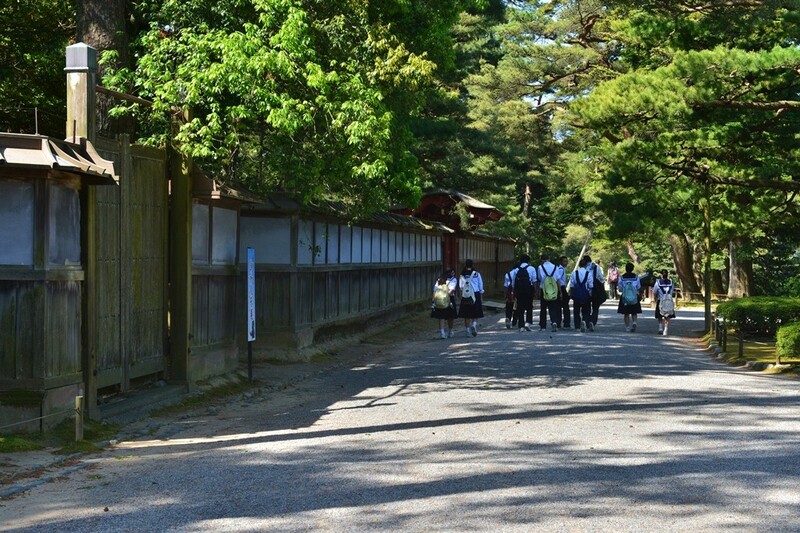 A typical visitor’s day in Kanazawa is likely to be packed and might even be scheduled down to the last nitty gritty minute! Kenroku-en might be overlooked because it will take at least an hour to stroll through the park and maybe even more to really enjoy the nature and garden sculptural work. The key to enjoying a trip is not always rushing through the motions and getting to destination after destination, however. 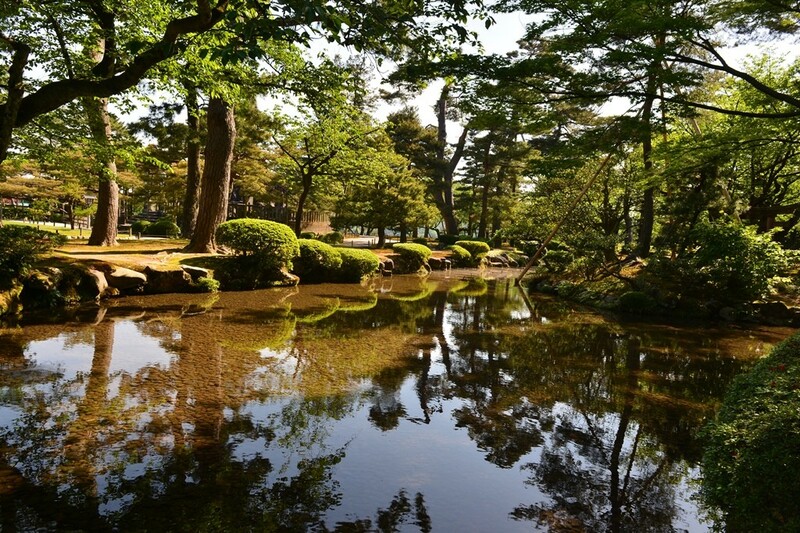 And perhaps more can be gained from a quiet, tranquil stroll through the Kenroku-en park if you are tired of days of shopping, riding on trains and taxis, and consuming delicious Japanese foods (who gets tired of THAT, though?!). Kenroku-en is bound to “set things right” and put you back in a relaxing mode– a mode that is difficult to attain at home when working Monday through Friday. The gardens await you– and will welcome you and consume you… We hope you will find your way out, because you will want to stay inside FOREVER!